Inspiring as it is, and yes, it is inspiring, to see the one-design AC45s racing in US waters, it stirs my appetite for the custom AC72s yet to come. Baby, you ain’t seen nothin’ yet. Whenever I do a public program about the America’s Cup, I run people slapdash through the history, because it’s a brilliant history. 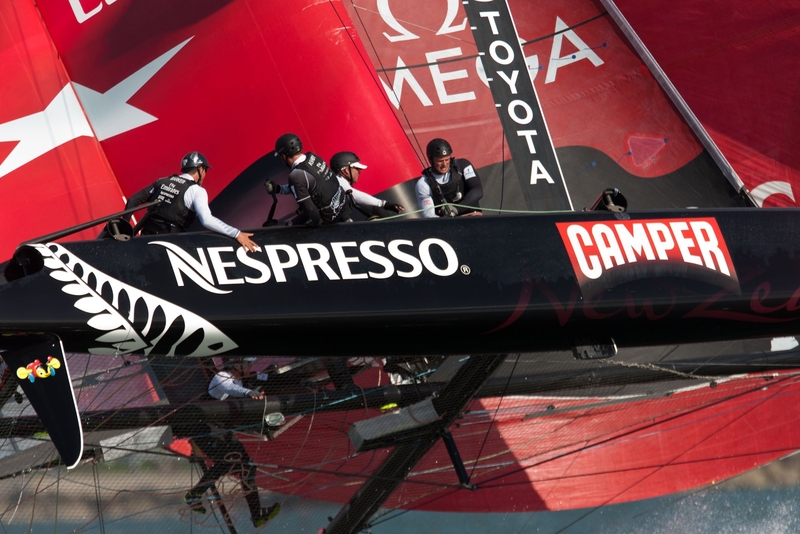 Consider how many times in its first 132 years—the longest winning streak in sports—the America’s Cup was defended against a faster boat. Consider how unlikely it was that Dennis Conner and company would push their losing, 1983 match to seven races against a much faster boat and almost keep that winning streak alive. Switch boats and . . .
How do you build a legend? I ask that, and then I run a show of AC45s on the fly. — there’s always a gasp. 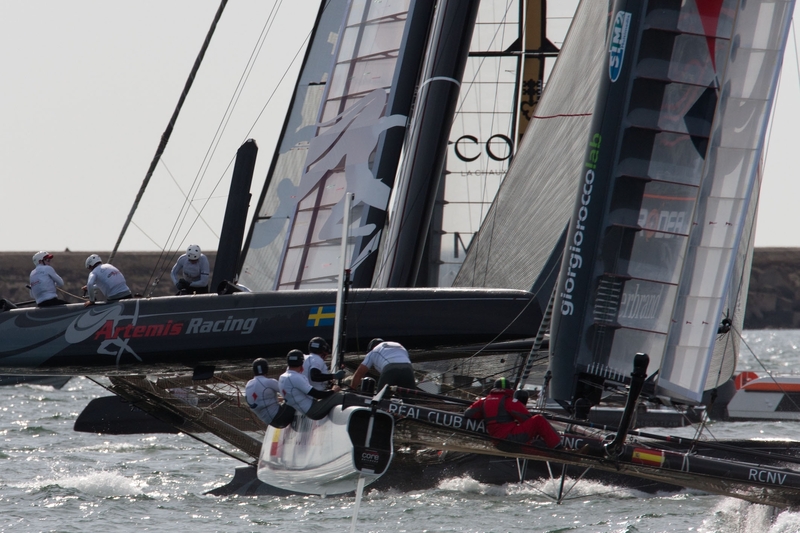 I remind the audience that the hulls, wings and foils of the AC45s are not cutting edge. They represent “safe” technology, because the engineers had to get it right the first time, to get this fleet sailing. And they got it right. Demonstrating that this much of the envelope is known. 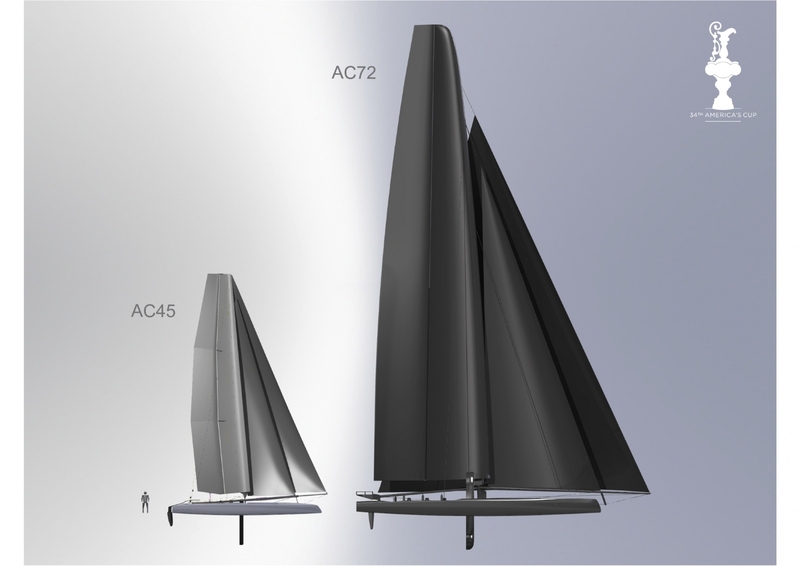 Under the design rule for the 72-foot catamarans that will actually compete for the America’s Cup, engineers are accorded dimension limits, and within those dimensions, they have a clean sheet of paper. More-complicated wings are a given. Curved daggerboards, supporting most of the displacement, are a given. There’s an invitation to over-achieve, because the time frame for trial and error is short, and it is easy to imagine creating something that is faster, but not manageably faster. In that lies the “art” of engineering. That is why the sailors talk to the designers, and the designers talk to the sailors, and designers get as much onboard time as they can. C-class racing has already demonstrated that a three-element wing is faster than a two-element wing. That is, a three-element wing with two vertical slots accelerating and re-attaching flow over the leeward side. I take it as gospel that we will see three-element wings when AC72s hit the water. But if a three-element wing is faster than a two-element wing, what about a four-element wing? Last summer, when Jimmy Spithill, John Kostecki and company took me for a ride on San Francisco Bay on Oracle 4, I looked up and observedthe obvious, but I had not thought this throughthat the inside, concave surface of the wingpicture yourself looking up from the deck to the windward, inside surface of a sailwas formed by a grouping of convex surfaces. A soft sail, or the underside of a bird’s wing, would be a continuous, smooth surface. Even to somebody with my Engineering-for-Dinosaurs eye, that cried out as an opportunity, however complex. Some time later, wearing my SAIL Magazine hat, I found myself at Pier 80, foot of Cesar Chavez Street, San Francisco. This is Oracle Racing headquarters until 2013, and I put the question to Burns and to Oracle Racing wing designer Scott Ferguson: Considering that bird wings don’t have convex surfaces on the lower, concave portion of their wings, aren’t we already seeing a built-in opportunity for performance enhancement? The answer was yes, sorta. So, somewhere, out there, what’s there? Compared to everything that went before, does that make the designers’ job easier or harder? PS: If you have a reservation with Payless Car Rental, cancel immediately. The crappiness will remain long after the savings are forgotten.